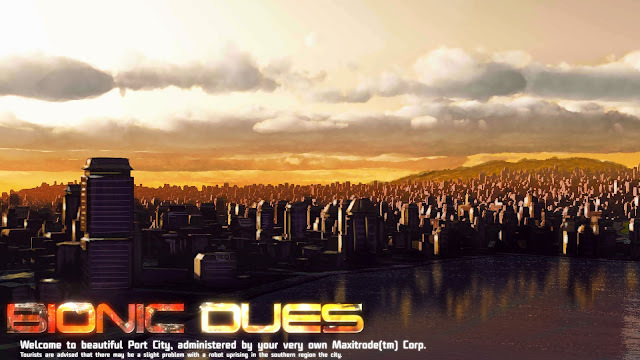 Bionic Dues will have a number of cities for you to do your campaigns in. So far the only one that we've implemented is Port City, which you can see an artist's rendering of below. 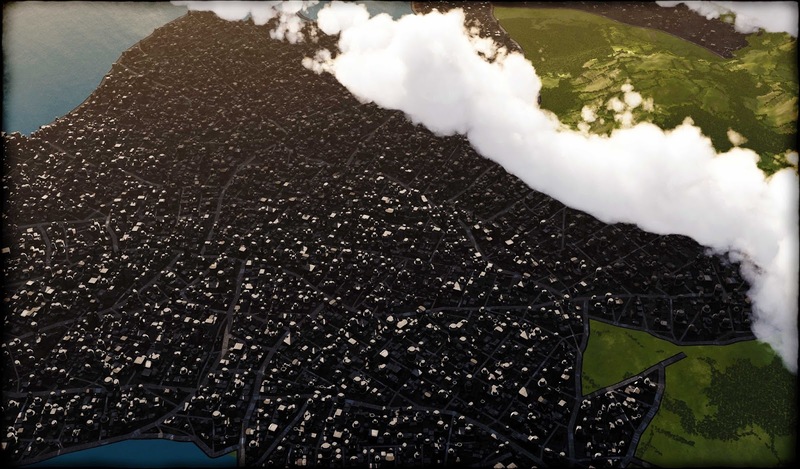 Note that the below is not in-game graphics, although a scaled-down version of this does show in the Start New Game menu when you are choosing your city. And below is the actual map image used for the in-game view of Port City (the background image, not showing the mission nodes or connections or HUD; soon, screenshots will be released that show the full in-game view. All of that map south of the cloud line has spots for a variety of mission nodes in buildings along the streets. Actually there are precisely 125 mission node spots, out of which you can complete a maximum of 50. So you have to choose your path wisely. Missions open up as you would expect along streets as you progress. Where you start in the city, and what nodes are where in general, is heavily procedurally randomized. There are a few rules about what cannot go next to what else, but beyond that it's very random. So you may start a game in the north, or down by the bay, or near the grassy outskirts, etc. Note: you can click the images above for full-sized versions. For purposes of this blog, they are way scaled down and fairly low-quality jpegs. Looks neat. Is the city walled, though? It's an odd transition how it goes from what appears as "dense metropolitian" to "grassland" as a sudden transition. Still, I'm looking forward to seeing how this develops. Not walled, no. If that's the biggest complaint someone has with a game of ours, I'll take it, though. It's a bit striking how there are no parks and no suburbs. Thematic thing? Other than that, the only thing I'd change would be to add some landmarks (think of how prominent buildings like the Eiffel Tower, Space Needle, Saint Basil's Cathedral, etc. stand out in their respective cities). True, but it is on the water, so a port is implied. Sorry, I should have clarified that those images are done done done done done. We're working on the game, not the details of one of the cities for tiny flavor. Would love to have that kind of time, but I think you'd prefer more interesting things from me, honestly.